Last night I needed a quick and easy dinner. It was very hot so I knew I didn't want to spend much time in the kitchen. I had some beef tips in the refrigerator, so I decided to make Teriyaki Beef Tips on the grill. Beef tips are a smart grilling choice for those of us who want quick, delicious meals. The beef tips are usually ready to go when you buy them from the store. You'll find very little trimming required. 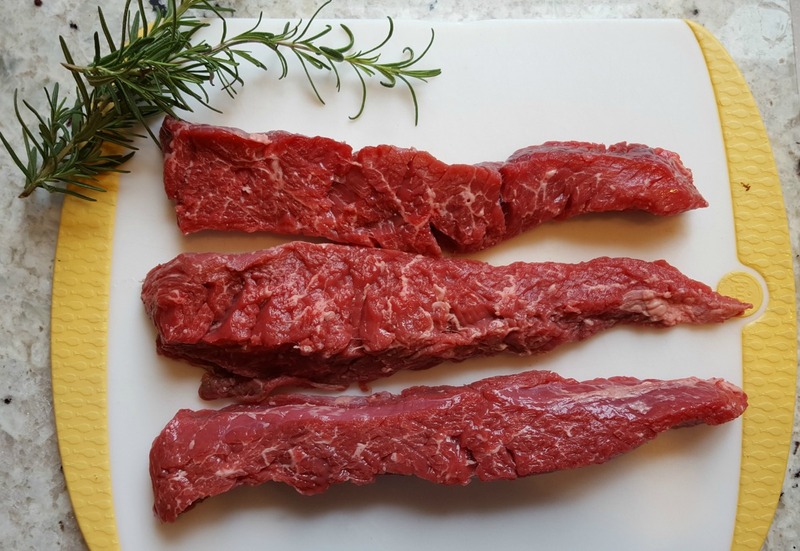 Beef tips are tasty when seasoned with a little salt, pepper, and garlic powder but they also taste yummy when flavored with a marinade. 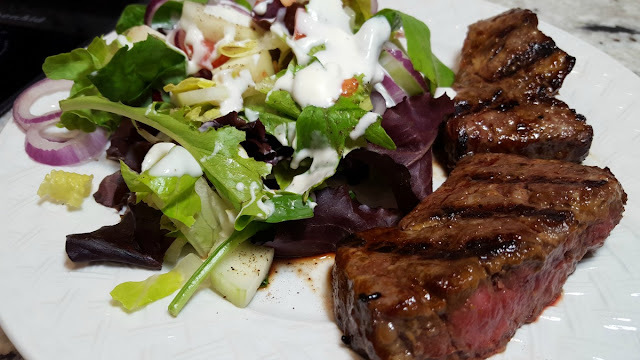 Earlier this summer I shared another of my favorite marinades. When I want to change it up I use this teriyaki marinade. It also works beautifully for chicken and pork, so you'll want to keep this recipe handy. 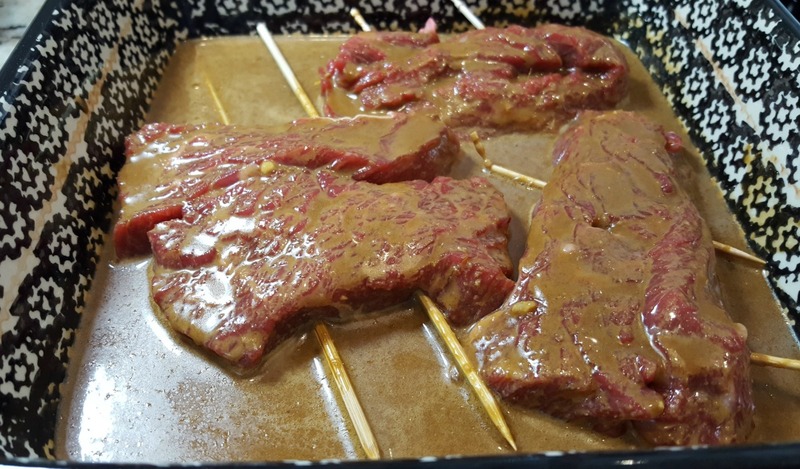 There is very little prep work required to make your teriyaki marinade. You'll find that the marinade is quick to make. Just allow yourself enough time for the the beef tips to marinate so the flavors from the teriyaki marinade are absorbed. Prepare the beef tips by removing any silver skin that may be attached. Set aside. In a 2-cup measuring cup, combine the soy sauce, oil, molasses, ginger, dry mustard, and minced garlic. If you have any fresh ginger on hand go ahead and grate some of that up instead of using the dry ginger. Mix well. I like to give my marinade a whiz in my blender. Once you combine the ingredients you'll know you have a good thing by the yummy smelling aroma. Place the beef tips in a glass or ceramic pan. For this meal, I cut each beef tip in half and skewered them together. That isn't necessary but it does make it a little easier to handle them on the grill. Pour your marinade over the beef. Cover and refrigerate for a minimum of one hour or up to overnight. You'll want to turn the meat periodically to make sure the marinade is absorbed by all sides of the meat. Cook the marinated beef tips on a hot grill until the beef reaches your desired level of doneness. Let your teriyaki beef tips rest for about five minutes before serving. I served my beef tips with a colorful tossed salad with fresh tomatoes and cucumbers from my garden. This is a perfect meal for a hot summer evening. 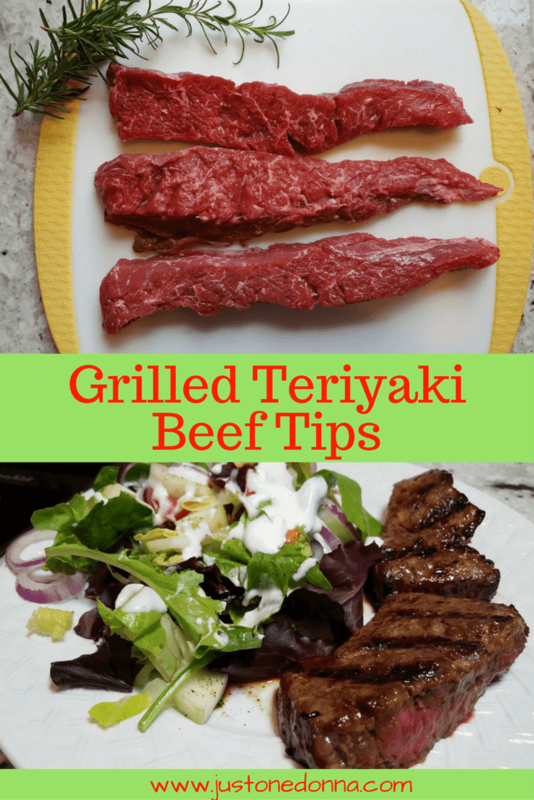 You could also cut your beef tips into chunks and make beef kabobs. Yummy! I love this Cuisinart Blender for so many things, including making marinades.